Unique Websites Search Engine Optimisation (SEO) services for Australian based businesses. Search Engine Optimisation (SEO) is the holy grail of all websites. It is the process of getting your website listed on the first page of “Organic” results on the major search engines when people search for your products or services. “Organic” results are the un-paid listings (ie. not ads) that the search engines believe best match what people are looking for. In other words...they are the results the search engines think you are looking for when you do a search. The challenge of course is that most search engines like Google, Yahoo! and Bing only have room for around 20 results listings on page 1...But don’t despair! 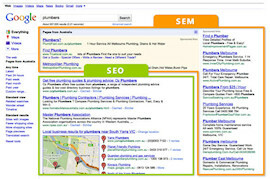 Our SEO experts have years of experience in getting websites highly ranked in all major search engines and onto page 1. Our SEO program is a strategy that builds the popularity of your website to the point where it is a very highly ranked website for the search terms that are most relevant to your business. The end result of all of this work is lots and lots of free customers, and a website that’s worth its weight in gold for years to come. If you’re really serious about building your business online, you can’t go past SEO to get you there. Talk to us today to get your website search engine optimised!